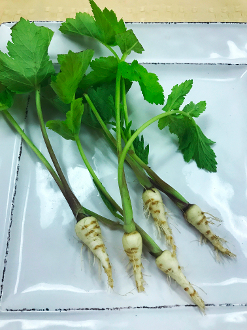 Cream colored, carrot shaped veggies with bright green stems and leaves attached. Sweet, nutty, earthy flavor. Can be eaten fresh or lightly cooked! Float on a cream soup, top filet mignon, or use as a mini veggie side dish for a tapa.